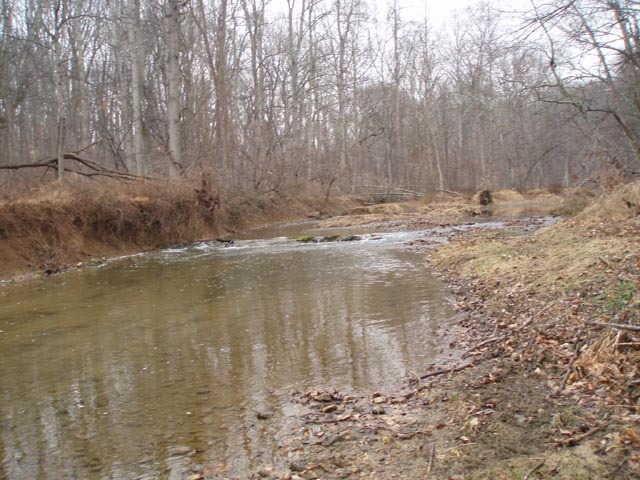 Description: With 1,250 acres, the Sweet Air section is one of the largest enclaves of Gunpowder Falls State Park. 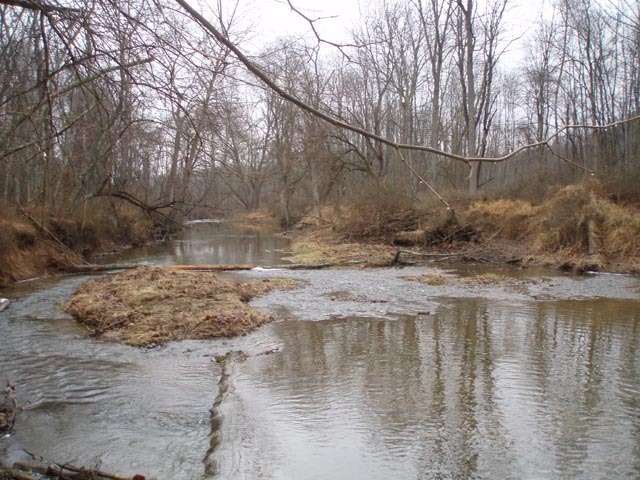 The Little Gunpowder River flows through its heart forming the border of Baltimore and Harford County. 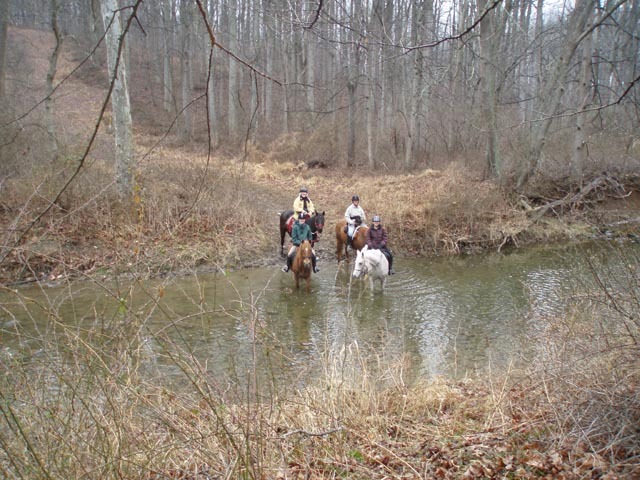 Eighteen miles of trails weave through the park. All but two, the Cody Jean and Red Dot Trails, are multipurpose. 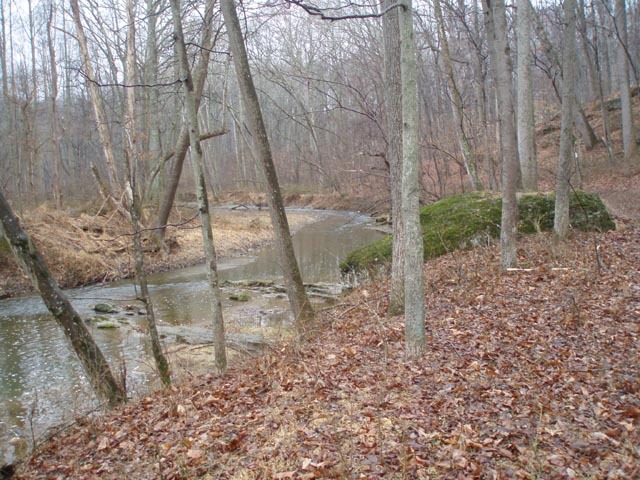 A mixture of pine forest, deciduous woods and open corn fields offers a wide variety of environs to hike through. 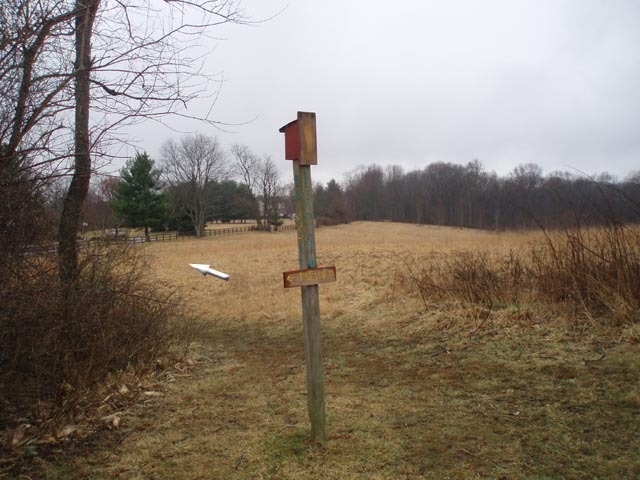 The edges of the fields and power line swath offer excellent birding opportunities. 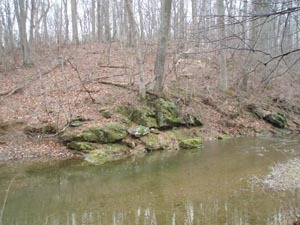 Sections of the Boundary, Little Gunpowder, Middle and Red Dot Trails offer pleasant stream-side views. 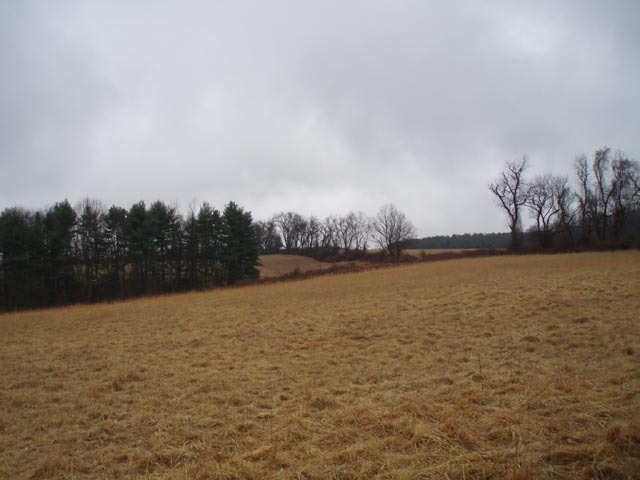 The hike described here is a relatively easy 6.2 mile circuit that covers the major aspects of the area. 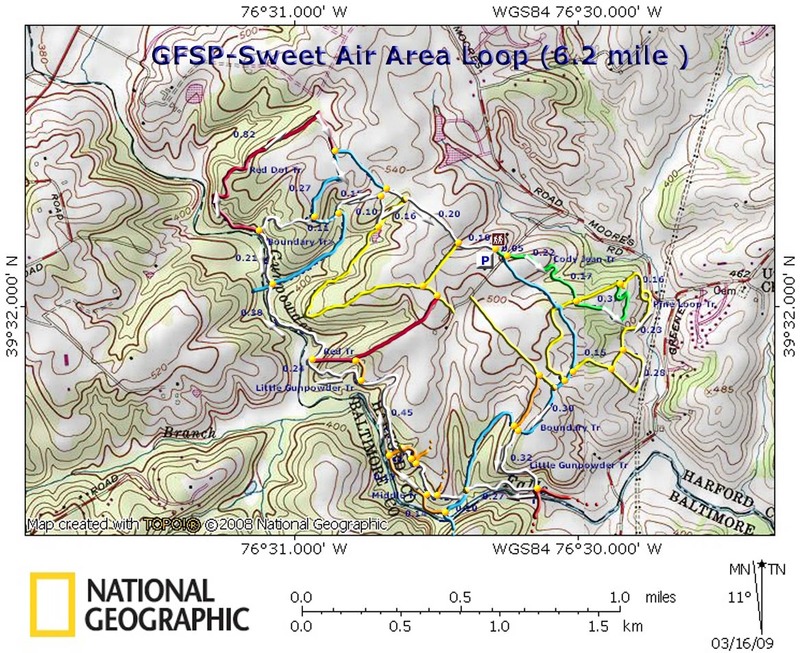 The hike can be modified by adding or subtracting trails. There are more trails to hike on the other side of the river but expect to have to wade in water anywhere from 6 to 18 inches deep. Note that none of the Baltimore County side or cross connector trails are shown here. 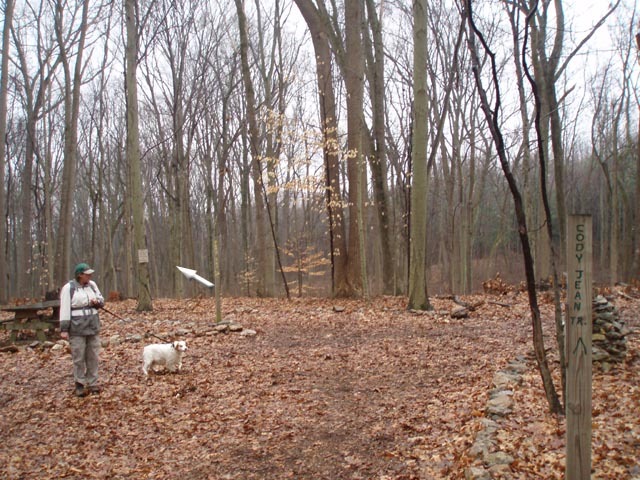 Our scouting also indicates that a new section of the white blazed Little Gunpowder Trail has been added since the last publication of the DNR map for the area (11/2005). The hike starts at a kiosk in a parking area to the right of the entrance road. Trail Notes: From the kiosk cross the entrance road and turn left onto the green blazed Cody Jean Tr. This trail weaves through an impressive stand of white pine. 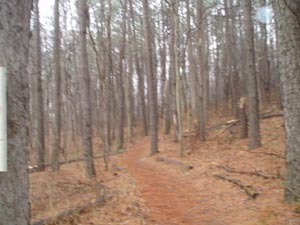 It will cross the yellow blazed Pine Loop Trail at 0.51 miles and end at the same trail in another 0.3 miles. Turn right onto the yellow blazed trail and descend towards Green Rd. The trail splits briefly (for horses and hikers) but comes together as it reaches the edge of a power line swath. In another 0.23 miles the trail splits again. The shortest way is straight ahead. 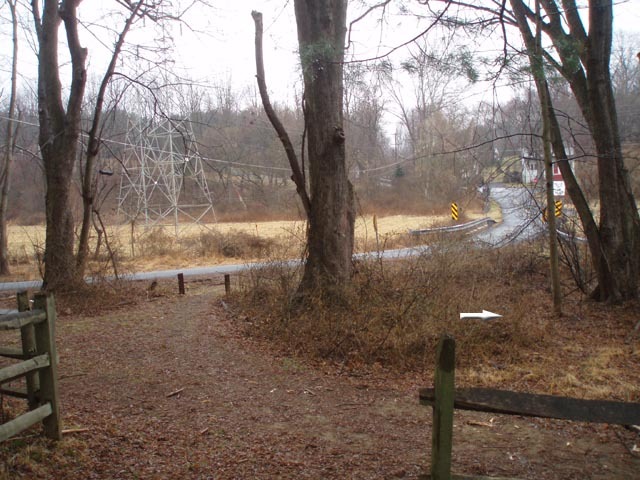 This hike has you turning left and following the power lines a bit further before bearing right and hiking past a large house on the left. 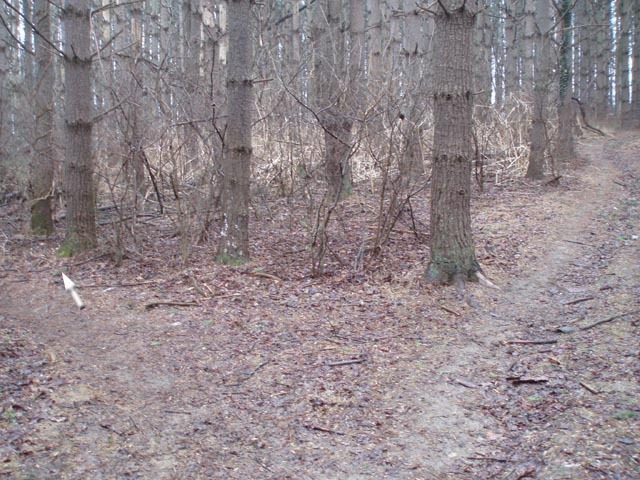 The short cut comes in from the right in 0.28 miles from the previous trail junction. In another 0.15 miles the blue blazed Boundary Trail comes in from the right to share the tread with the Pine Loop Tr for a short distance as you bear to the left. 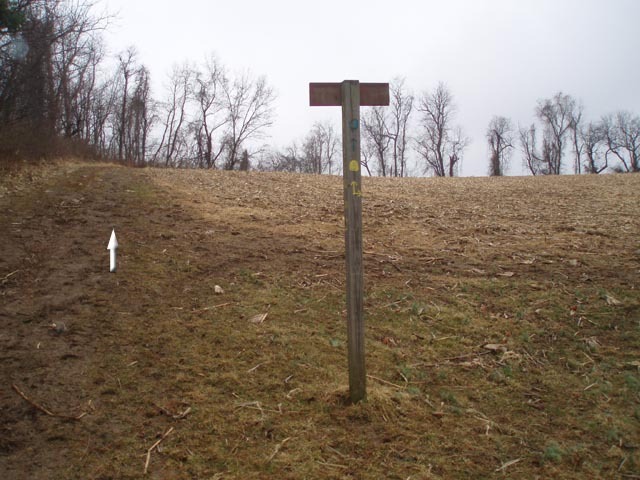 The yellow trail will turn sharply to the right to follow the edge of a corn field. Stay straight on the blue Boundary Tr. 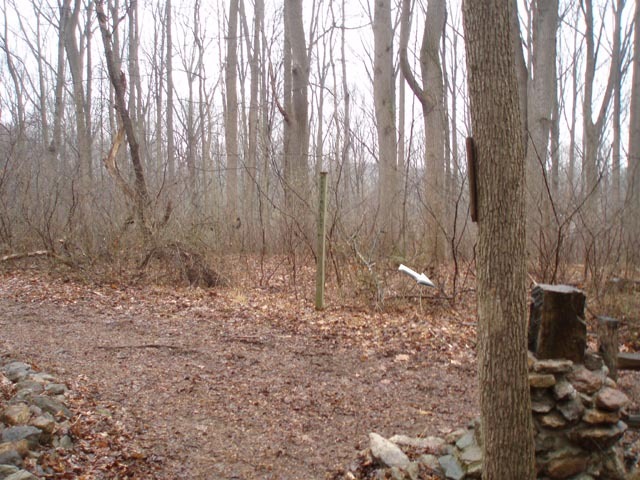 In a very short distance the blue trail will bear to the left a bit and start following a wooden fence as another yellow trail takes off to the right. Follow the blue trail. 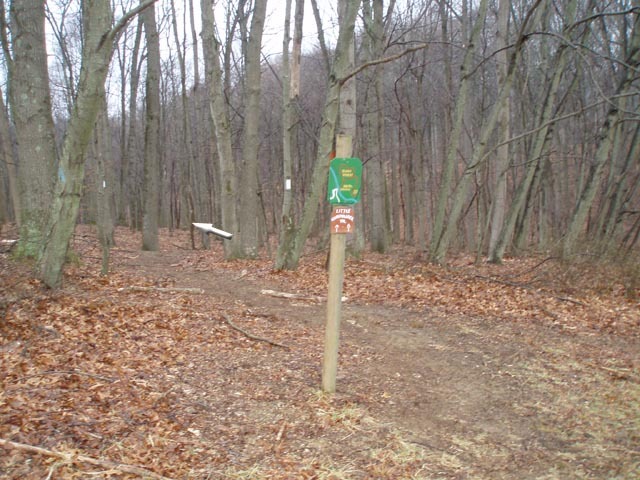 In 0.30 miles the blue Boundary Trail will turn right and begin to follow the edge of some woods. Turn left onto what I think is a new extension of the white Little Gunpowder Tr. 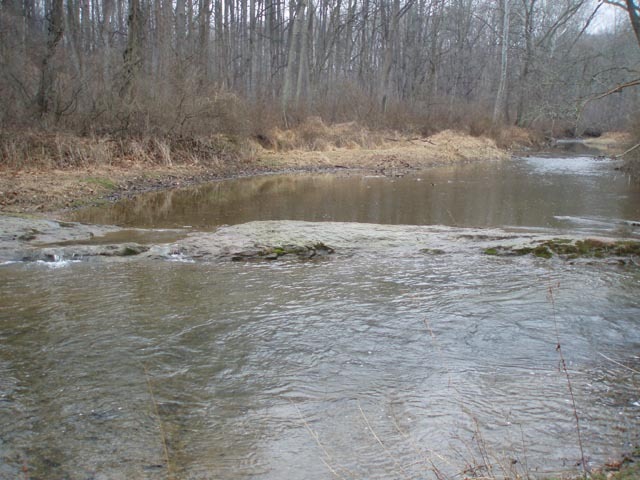 It is not shown on the 11/2005 DNR map of the area. As you approach private property on the left you�ll pass a small �appliance dump�. 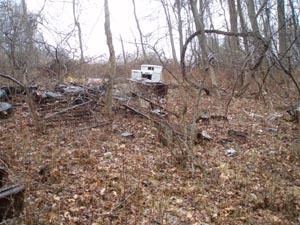 (I hope the park intends to remediate this eye sore.) The rest of the new trail is a pleasure to hike on. In 0.32 miles from the last trail junction the trail turns right to follow the river. There is a trail to the left that leads to Green Rd. A ford of the river straight ahead leads to a red trail that supposedly leads to an area called the Black Forest. This hike has you turning right on the white trail. In 0.27 miles turn left onto the blue blazed boundary Tr again. 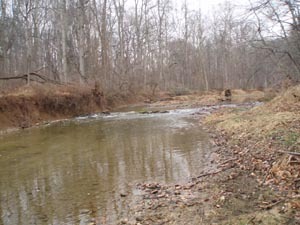 In another 0.20 miles the Boundary Trail crosses the river. Stay straight on the orange blazed Middle Trail. 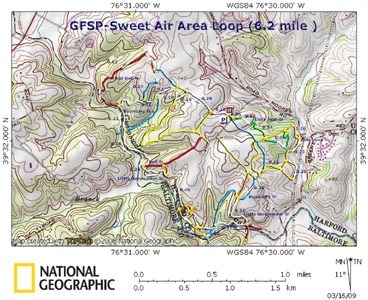 A spur trail takes off sharply to the right at 0.14 miles and climbs to the Little Gunpowder Tr. Ignore this unless you are encountering very muddy conditions. 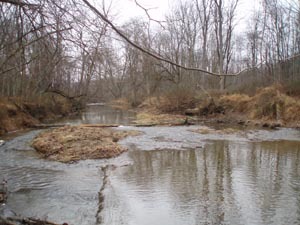 The Middle trail will also cross the river in 0.30 miles. Just before the ford turn right and climb steeply a short distance to the Little Gunpowder Tr. Turn left onto it. In 0.45 miles pass another orange trail on the right and in another 0.24 miles pass the Red Tr on the right. 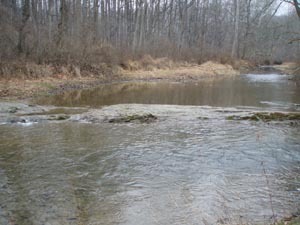 From here the trail descends to the river and in another 0.38 miles crosses the blue Boundary Trail at its northern ford of the river. 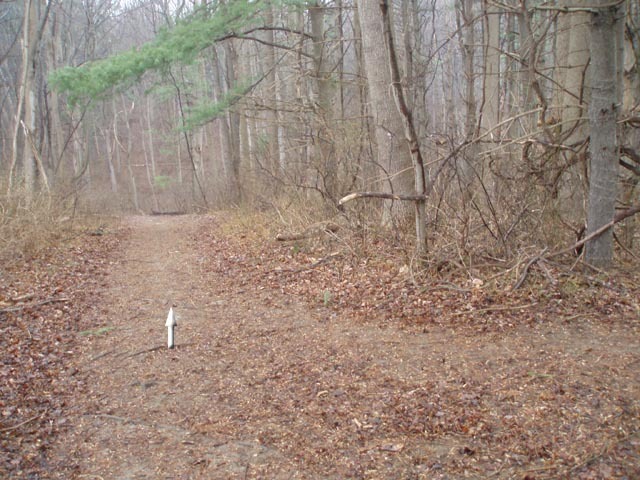 In 0.22 miles the white trail turns to the right. Stay straight on the Red Dot Tr and cross a wooden deck. 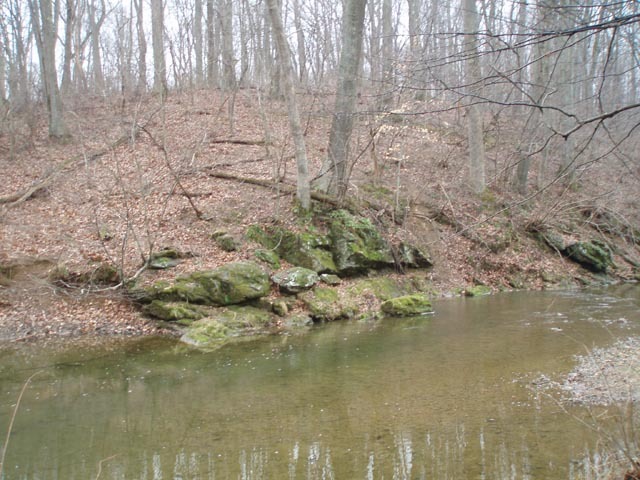 After following the river a little further the trail turns right and gently climbs a hill through the woods. 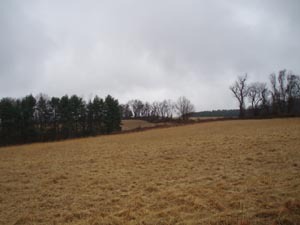 The trail makes a sharp right turn as you near private property and enters another corn field. At 0.82 miles from the last trail junction the Red Dot Trail ends and the blue Boundary Tr is straight ahead and to the left. Continue straight. 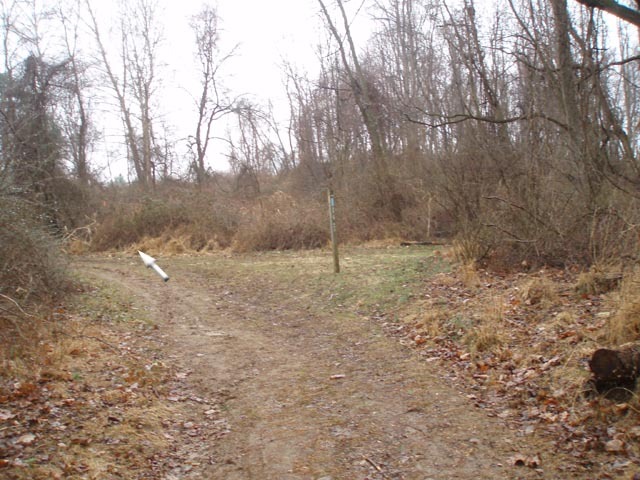 In 0.27 miles the trail re-enters the woods and meets the white Little Gun Powder Tr. Turn left on the now shared trail but in 0.11 miles bear left onto the white trail. In 0.15 miles cross a gas line swath and turn right onto a spur trail that leads to Barley Pond. 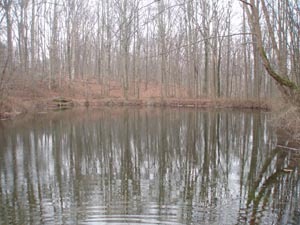 After visiting the pond turn around and follow the yellow Barely Pond Tr back to the continuation of the Little Gunpowder Tr. Turn right and in 0.30 miles arrive back at the parking lot. 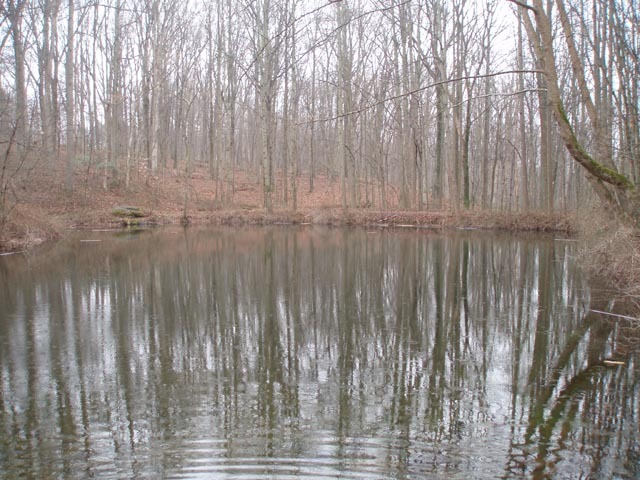 You�ll pass another terminus of the Barely Pond Tr at about 0.2 miles from the last trail junction. Critique: Ran this loop today and on one other occasion. Very beautiful area considering how close it is to Baltimore. The river is pretty and some of the fields are nice as well. 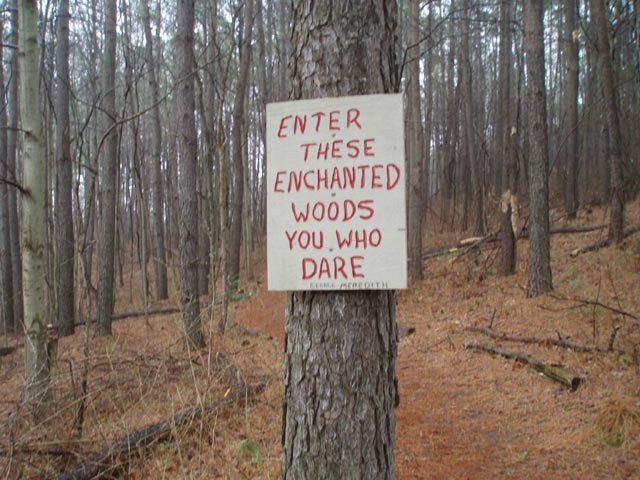 All of the trails on the N side of the river are well-marked with signs and blazes. It can get confusing because there are so many trails but it's impossible to get lost and there are signs that lead you back to the parking area from many junctions. Did not get to the trails on the other side of the river, but have read good things about them as well. The loop described on this site does a good job of keeping you on narrow footpaths as much as possible and seeing the best scenery of the area. Some of the other trails are wide, straight, and eroded.